This is a list of the three generations of ICBMs produced and deployed by the United States during the Cold War, with a fourth generation ICBM being deployed in small numbers at the end of the Cold War in 1991. Development of Intercontinental ballistic missile (ICBM) technology as an outgrowth of the World War II V-2 rocket technology developed by Germany, and the mating of nuclear weapon technology developed by the United States created an entire new method of warfare. Due to their great range and firepower, in an all-out nuclear war, land-based ICBMs would carry most of the destructive force, with long-range, nuclear-armed bombers and Submarine-launched ballistic missiles carrying the remainder. These three components were collectivity referred to as the United States nuclear triad. The United States Air Force Strategic Air Command (SAC) was the US military command and control organization for ICBMs and nuclear-armed bombers. Over a million men and women served in SAC, on daily alert 24 hours a day, with a mission to preserve the peace and deter any aggressor nation from attacking the United States and its allies. Note: The PGM-17 Thor and PGM-19 Jupiter Medium-range ballistic missiles (MRBM), or the SM-62 Snark intercontinental cruise missile developed by the US Air Force in the 1950s are not included on this list. 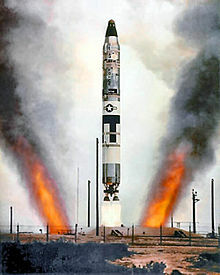 The First Generation SM-65 Atlas, was the United States' first successful ICBM, flown in 1957, and taken out of active service in 1965. Strategic Air Command deployed Atlas model D, Atlas model E, and Atlas model F. The Atlas used liquid fuel and it took 15 minutes to pump 249,000 pounds of propellant aboard the "quick firing" Atlas F. It was dangerous work. Four Atlas silos were destroyed when propellant-loading exercises went awry. As an emergency measure, from September 1959 until 1 May 1964 the Air Force deployed three Atlas D missiles on open launch pads at Vandenberg AFB, California, under the control of the 576th Strategic Missile Squadron, 704th Strategic Missile Wing. Completely exposed to the elements, the three missiles were serviced by a gantry crane with one missile on alert at all times. NASA used a modified version of the Atlas-D (Atlas LV-3B) in the Project Mercury program and launched four astronauts into space in 1962–1963. A variant was also used in the Project Gemini program from 1966. The Second Generation LGM-25C Titan II, first flown in 1961 and taken out of active service in 1987, was the successor to the Titan I, and carried a payload twice as heavy. It also used storable propellants, which reduced the time to launch and permitted it to be launched from its silo. Titan II carried the largest single warhead of any US ICBM to date. A modified version of the Titan II (Titan II GLV) was used during the NASA Project Gemini program with ten manned launches of spacecraft. (1965–1966). The Third Generation LGM-30 Minuteman, first flown in 1961 was developed to replace the hazards inherent in the caustic, volatile liquid-fuel systems of the Atlas and Titan ICBM's. Two innovations gave the Minuteman a long practical service life: a solid rocket booster making the Minuteman faster to launch than other ICBMs, and a digital flight computer, one of the very first recognizably modern embedded systems. 319th Missile Squadron "Screaming Eagles"
321st Missile Squadron "Frontier Warriors"
91st Strategic Missile (later Space, later Missile) Wing "Roughriders"
740th Missile Squadron "Vulgar Vultures"
742d Missile Squadron "Wolf Pack"
10th Missile Squadron "First Aces"
12th Missile Squadron "Red Dogs"
44th Strategic Missile (later Missile) Wing "Black Hills Bandits"
Inactivated 1994 when Minuteman II phased out of inventory. Inactivated by BRAC 1995; missiles reassigned to 341st SMW. Inactivated 1995 when Minuteman II phased out of inventory. 576th Flight Test Squadron — Vandenberg Air Force Base, California — "Top Hand"
Today, all United States ICBMs are LGM-30G Minuteman IIIs. The Air Force planned to keep the missile in service until 2020, but it may be upgraded to stay in service until 2030. The fourth-generation LGM-118 Peacekeeper initially known as the "MX missile" (for Missile-eXperimental), was a land-based ICBM deployed by the United States starting in 1986. A total of 50 missiles were deployed. They were withdrawn from service in the early 2000s (decade), the last taken offline in 2005, primarily for budgetary reasons. Armed with up to 10 re-entry vehicles each carrying a W-87 thermonuclear warhead, the Peacekeeper was the most powerful ICBM deployed by the United States. This page was last edited on 31 December 2018, at 12:05 (UTC).